StageBuzz.com: "The Family Room" - What's the state of things? Have you ever felt like your therapist wasn’t really listening to you? His responses seem too rote, like he has heard your story dozens of times before. He can rattle off the right prodding question or reassuring phrase without being truly attentive to the nuances of your emotional state. 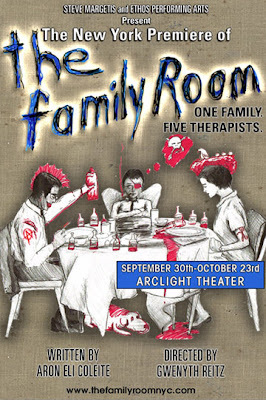 Unintentionally, there is a lot of this going on among the actors in The Family Room, a play in which five out of seven characters are psychologists or psychiatrists (the other two are disqualified from the profession by virtue of being teenagers). The performances are assured but a bit too polished, to the point where it often doesn’t feel like the players on stage are genuinely listening and responding to each other in the moment. This isn’t true throughout, and indeed some of the most pivotal scenes feel quite alive, thanks in large measure to the excellent Tyler Lea as 15-year-old David, a standout in this ensemble. But combined with the acting, the overall effect of this play by Aron Eli Coleite, directed by Gwenyth Reitz, is of therapy that’s not working, skimming along the surface of problems while rarely penetrating to their roots. The play opens with David (Lea) being interrogated by his parents (“What’s the state of things?” is a question the therapists in the play often open with). We gradually learn that dad (David M. Pincus) is considered a brilliant therapist, highly dedicated to his career, and mom (Nancy Stone) took up the profession to feel closer to her husband. It’s telling that it’s initially hard to discern if the opening scene is a family chat or a session with not one but two therapists treating a troubled adolescent. David is the subject of his parents’ clinical concern and expertise as much—likely more—than their parental support and affection. David of course has his own therapist, and so do each of this parents and, in turn, each of their therapists, all of whom we meet in turn. Roughly 80 percent of the play unfolds in these various therapy sessions. We also meet Jennifer (Leah Baker), a classmate of David’s who is even more troubled than he. She is being treated by David’s dad, and David befriends her in an act that is one part simple yearning for connection and one part borderline pathological desire to get back at his father. His overture unleashes a cascade of consequences with the potential for a real tragedy, one that would leave almost none of these people unscathed. The budding friendship and love between the teens is by far the most compelling element here, and makes the play worth watching—the problem is we just don’t care that much about the other characters. One reason for this—and an inherent problem in the play—is that we learn about them, their issues and histories, in large measure through their conversations with their therapists. Like therapy, it’s a lot of sitting around and talking. One of the reasons David’s character works the best may be that he actually has more to do. We get to learn things about him through his actions, as well as dialogue that extends beyond the couch confessional. The play also takes it upon itself to make observations about the profession. Some we’ve seen and heard before—the over-medicated psychiatrist, the fact that a career helping people doesn’t mean you’re a nice person, and the idea that people choose this work because the magazines in their waiting room are far from their only issues. Some of it, like a section about patients’ suicide notes, which need to be kept in a file for insurance purposes, were new to me. Nearly all the action takes place in the pastel living room/therapist’s office, capably designed by Jian Jung. One of the exceptions is the tender scenes between David and Jennifer atop a high-rise building overlooking the city, which are a refreshing change staging wise and overall the strongest in the show. The other is quick vignettes that take place in a waiting room-type area behind the main set, revealed behind a window when vertical blinds open in the main sitting room. While visually this is a nice idea, these moments, mostly little outtakes of the therapists waiting for their sessions, happen too quickly. At least from where I was sitting, I couldn’t really register what was going on. Tyler Lea as David looks quite a bit older than 15 (and as we can tell from his credits in the program, in fact he is!). But through his voice and physicality, he manages to convincingly portray the whiny, slouchy, fidgetiness of a boy that age while hardly ever becoming annoying—not an easy feat. Moreover, nearly every time he opens his mouth, it feels direct and honest, like a shot straight through the heart. This is especially crucial for his character, who underneath the rashness and angst is in many ways the voice of reason here. We’ll be on the lookout for Lea’s next show. There are other good moments—the confrontation between David and his blustery, arrogant father toward the end is the emotional showdown it needs to be, and Lea and Pincus play off each other well here. Jonathan Tindle is smarmy and sharp as the pill-popping Dr. Schwartz. Coco Medvitz as the young, insecure Dr. Goodwin delivers a reminiscence of her own troubled youth with both humor and regret. Nancy Stone as David’s mom is convincingly anxious and conflicted as a woman flailing in her efforts to move toward happiness. Jacqueline Sydney is wry as Dr. Durant, and Leah Baker plays Jennifer as an emotional girl who knows she’s supposed to hold herself together but is always about to burst. If only they all took a little more time to engage with each other. And if only the script had room to better flesh them out. They feel a bit more like character descriptions than real people, David being the exception. It is to the play’s credit that some of David’s most pressing questions—Do you need therapy if you have love? If it works, why do so many people have to do it forever?—don’t get answered. I didn’t find The Family Room entirely satisfying, but I hope playwright Aron Eli Coleite keeps on trying to work things out.